You need nice things to give to nice people. Because it’s the holidays and that’s what you do around this time of year. So we went out and found those things for you. Bonus: none of them are socks and all of them will help you win at snow. Something’s different about this splitboard. Let’s start with the obvious: it’s the apex of board-related beauty. Less obvious: they’ve fused two actual skis together, thus making it “the lightest splitboard on earth.” You can lift it with two fingers. Three if you have weak fingers. 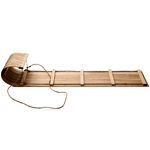 A toboggan made of air-dried wood provides a more pliant, smoother sledding experience. Everybody knows that. So you’ll be pleased to hear that a very patient craftsman in Canada just spent 365 days sucking moisture out of logs to make this one. His other hobby is watching paint dry. Cigars and winter. What a team. 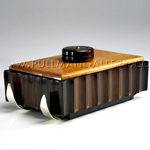 In fact, you should probably pick up this overly handsome art deco cigar box for the aficionado on your list. It’s... unique. Blame it on the ebony body. Or the sycamore lid. 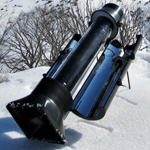 Or the miniature skis attached to the bottom. Yeah, that last one. This is a thermos. It keeps hot toddies hot with a little help from the sun. Here’s how it works: 1) Open the doors (yes, this thermos has doors). 2) Let the reflective panels catch the sun’s rays and automatically heat what’s inside. 3) Enjoy the drinking of warm things. Nobody makes cashmere headgear better than Jay Z. We think. 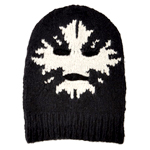 You see, he’s teamed up with California-based cashmere enthusiasts Elder Statesman to make these supremely dashing, limited-edition ski masks with Rorschach blots on them. Squint and they look like Beyoncé.